The Museum of Flight’s newest permanent exhibit, The Spaceflight Academy, surrounds the actual Space Shuttle Trainer used by NASA astronauts. The exhibit offers visitors to the museum a vast amount of information about the Space Shuttle and its explorations. The Museum of Flight chose CD Meyer/point2explore to develop a responsive, web based, handheld app that allows visitors to personally engage with the exhibit. The application displays questions related to each of the five exhibit sections, with the answers available throughout the gallery. The online app was developed to run on iOS, Android and Windows based handheld/tablet devices using the free Wi-Fi that the museum offers in its Charles Simonyi Space Gallery. The application is comprised of five sections which correlate with each of the five sections of the Spaceflight Academy exhibit. 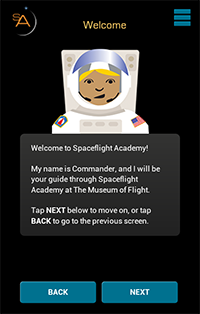 A friendly Astronaut named "Commander" helps users navigate the Spaceflight Academy experience. Each section has a mix of 6-10 multiple choice questions and point2explore’s Order SorterTM games challenging users to place shuttle related images in order based on a process unique to the shuttle. Correct responses are congratulated with a fun fact. Incorrect responses prompt a response to try again. The program was designed to allow visitors to begin their online experience from any of the five exhibit sections. Progress in the app is saved along the way so that if a session is completed or abandoned, visitors can resume the experience at a later date. After all five sections of Spaceflight Academy have been completed, the user is presented with a personalized mission patch, containing their name, assigned role, destination, and mission. Their mission patch can be shared with friends via email, Facebook and Twitter stating that they've graduated from the Spaceflight Academy! Behind the scenes of the app is a backend CMS allowing the museum to update the educational content as often as needed and collecting data such as name, date, score, categories played, progress, answers to questions and duration of play.